I have to admit, when I first read Foundation (probably sometime around age 15), I didn’t really understand much of what was going on. I remember reading it partly because it was supposed to be a “classic,” but mainly because it had a cool cover. The overall ideas and themes interested me, but the dense exposition, foreign settings and growing list of minor characters (whose names I had trouble pronouncing) were just a little too much for my impatient teenage mind to process. Maybe it was because it was one of the first real science fiction novels I’d read and I just wasn’t accustomed to the peculiarities of the genre. Either way, I’m glad that I gave it a second chance later in life. The part of the book that intrigued me the most (both times I read it) was the concept of Psychohistory: a fictional branch of science that used elements of mathematics, history and sociology to help predict human behavior over long periods of time. While not quite true prescience, the idea that you could use statistical principles and human psychology to, essentially, look into the future was a fascinating idea. 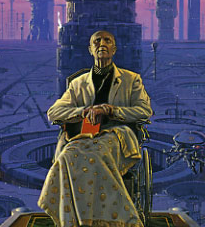 In the novel, the main character Hari Seldon is able to use psychohistory in order to predict the downfall of the current Galactic Empire – as well as a 30,000 year period of barbarism to follow. In order to shorten the time period between the fall of the Empire and the rise of a second empire, Seldon sets out to create a collection of the entirety of human knowledge (the Encyclopedia Galactica) – compiled and protected by an organization known as the Foundation. planets that were rapidly devolving into barbarism. The second novel, Foundation and Empire, introduces another threat to the Foundation: The Mule – a mutant conqueror whose unique ability to alter people’s emotional allegiances was not accounted for in Seldon’s predictions, and which ultimately leads to a confrontation with the Foundation. As its title suggests, the final book in the original trilogy, Second Foundation, recounts the discovery of a parallel Foundation at the opposite end of the universe – whose true purpose is eventually revealed. While it would be hard to call Foundation action-packed (most of the actual fighting and war takes place “off-screen”), there is just enough intrigue and suspense to keep the story humming along. But even though it has its entertaining elements, I would recommend this book to a friend as a novel of “Ideas.” Sometimes you’re just not ready to appreciate something like that at first (I wasn’t). But if you are, there are few better places to start than Asimov’s crowning achievement. This entry was posted in Far Future, Social Science Fiction, Uncategorized and tagged Isaac Asimov. Bookmark the permalink.